The Kaudern's Cardinal, also known as the Banggai Cardinalfish or Longfin Cardinalfish, is a very attractive fish with a simple yet sophisticated color scheme and marking. Its overall body coloration is a shimmering silver, highlighted with pearly white spots. Bold, black stripes along the body accentuate the long fins to elegant effect. LiveAquaria proudly offers captive bred Kaudern's Cardinalfish bred and reared in Indonesia and Asia that are hardier than their wild harvested counterparts. House the Banggai Cardinalfish in a well-filtered 30 gallon or larger aquarium aquascaped with a generous amount of live rock. Carefully arrange the aquarium landscape to create plenty of caves, overhangs, and crevices as well as an open area for swimming. House the Kaudern's Cardinal with peaceful tank mates as it is a slow and methodical swimmer. 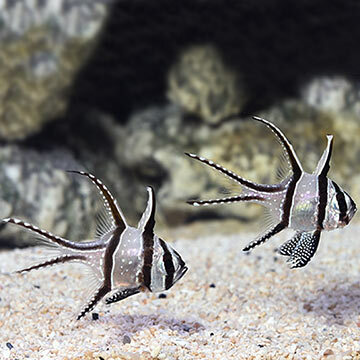 Due to its aggressive behavior towards conspecifics, the Banggai Cardinalfish should be kept individually or as a bonded pair. Groups of Banggai Cardinalfish can be kept in relative peace in larger systems with plenty of swimming and hiding spaces. Moderate water movement will also be appreciated by the Banggai Cardinalfish. The Kaudern's Cardinal is relatively easy to breed in the aquarium setting. Once spawning has occurred, the male carries the eggs in his mouth to protect them. The Kaudern's Cardinal should be fed a well balanced diet of meaty foods such as feeder shrimp, marine flesh, bloodworms, and depending on its size, live feeder fish. Approximate Purchase Size: Small: 1/2" to 1" Medium: 1" to 2"
This is a nice peaceful little fish. I have a pair and I'm thinking of getting more. When I first added them to the tank, one wedged itself between the glass and a rock and I had to free it, but it recovered. They get along very well with my clownfish and have not bothered my shrimp at all that I can tell. They eat mysis and cyclops, but appreciate live brine shrimp as a treat. These cardinals are extremely easy to acclimate. No one should have any problems caring for these little guys. Wonderful active fish. Mine were eating straight out of the bag. I ordered 3 and all made it but 2 have paired up and left the third out of the group but the third has plenty of room so no fighting has happened. Highly recommend these for anyone. I have three of these little fish. It took a couple of weeks for all three to come out of hiding, but now they come to the front of the tank when I walk up. They are doing very well and are quite beautiful close up.